Color may vary - we have no control over which color (orange or silver) the mfg provides. 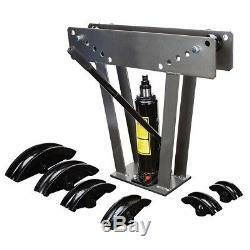 Constructed with a heavy duty steel frame, the 12 ton hydraulic pipe bender can handle tubes or pipes up to 2 wide. Bending bars can easily be adjusted to distances of 8-1/2", 11-1/4", 12", 16-3/4", 19-1/2" and 22-1/4". Six precision cast dies are included. Bends 1/2" to 2" wide round or square pipes, tubes or solid rods Bending bars can be adjusted from 8-1/2" to 22-1/4" EXACT COLOR MAY VARY!! Jack capacities: 13-1/4" minimum, 22-3/4" maximum 9-1/2 stroke Includes 6 precision cast dies Capacity: 12 tons Diameter: 1/2 in. Material: Steel Product Depth: 6-1/2 in. Accessories Included: 6 dies NPS (Nominal Pipe Size) Pipe OD (Outside Diameter) (inches) (inches) 1/2 0.840 3/4 1.050 1 1.315 1-1/4 1.660 1-1/2 1.900 2 2.375. For those that may be interested, our business started out of necessity when my wife developed stage IV breast cancer (spread to her bones). Although only given a 20% chance to survive five years, through Gods grace, we are already into year eight! Although we deal with occasional medical emergencies that strain our work schedule, we believe God has shown us that He provides and cares for those that trust His word and conduct themselves with honesty and integrity. We strive to pass that on through our business and our children, who often run the day-to-day operations for us. If you are so inclined, please put us in your prayers and give the patience and understanding when needed as we try to do for all our customers. Tracking will be uploaded about a day later. The best thing to do is to refuse it as damaged on the spot. We work very closely with our customers. As hinted on above, this business provides critical support for a family dealing with major medical expenses. We have no incentive to anger or disappoint you and work VERY hard to satisfy our customers. We only ask that you consider this and realize that rare mistakes may happen. Please see item specifics in the listing above for full return options. This enables you to replace the item for free within that time period. See product instructions for more details when the item arrives. While rare, it does happen sometimes that our suppliers cannot provide the item in a timely fashion. Again, this is rare and due to the great value and demand for our items. Rest assured this is a complete administrative hassle and waste of time for us. It is not something we want to do. Remember this is law written by your elected officials and we welcome you contacting them to stop taxation on internet sales. The item "Hydraulic Pipe Tube Bender 6 Dies Tubing Exhaust Bending 12 Ton HEAVY DUTY NEW" is in sale since Tuesday, November 10, 2015. 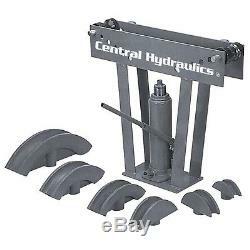 This item is in the category "Business & Industrial\Hydraulics, Pneumatics & Pumps\Pipe & Tubing Tools & Accs\Pipe Benders". The seller is "readjohn155" and is located in Camarillo, California. This item can be shipped to United States.